Begun in 1728, Queen Square looked much different in the mid-eighteenth century than it does today, specifically its centre. The Square once contained a formal garden surrounding a tall obelisk with an elegant stone balustrade originally enclosing the central space. Made up of rectangular die and balusters, the balustrading was replaced by iron railings in the 1770s. 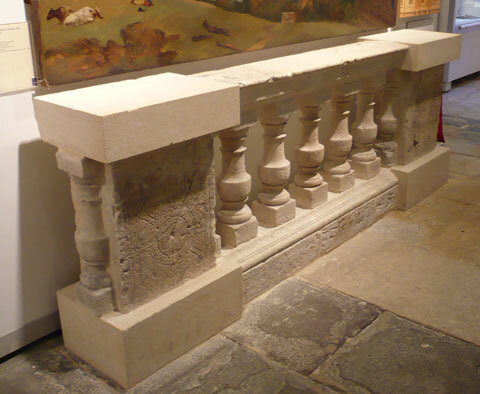 This section of the balustrade was removed to a local garden in 1775 and its fragments were rescued and given to the Bath Preservation Trust in 1972. These two rectangular die (that is, the two large rectangular blocks on either side of the balusters) have carved into them John Wood’s original plan for Queen Square; one has since been used as a sundial (left), while the other (right) records mason’s marks and the exact date on which the balustrading was removed: 8 August 1775. In 2004, the Bath Stone Group kindly donated new stone and restored the balustrade to its original appearance. Allen’s Panorama was painted from Beechen Cliff, above the southern side of the city, and depicts Georgian Bath nestled in the valley created by the surrounding hills. 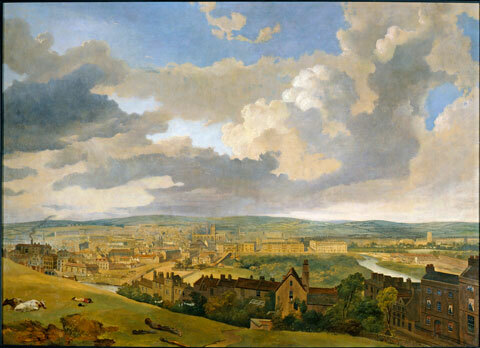 Bath Abbey is clearly visible in the centre of the painting and the Royal Crescent can be seen in the middle ground to the far left. Built on a 1:500 scale, this model took 10,000 hours to build. It was commissioned by the Bath Preservation Trust in 1965 and executed by Hugh Watson Associates with sponsorship from the Bath & Portland Stone Group. At the time the model was commissioned, many of the city’s historic buildings were in danger of demolition, and a huge effort was made to preserve them. The buildings considered worthy of preservation were executed in detail in the model, so tiny architectural details were painstakingly depicted on the buildings deemed most historically important. This required considerable ingenuity: the columns in the Circus are actually pencil leads, and the acorns around the parapet are sanded-down hatpins. In 1992, the principal new buildings were added with the assistance of the University of Bath. This exquisite marquetry panel was undertaken in the 1790s as an example of a cabinetmaker’s skill. Often, as part of a joiner’s apprenticeships, he would construct a tool chest and decorate the inside of the chest lid. This would serve as a personal advertisement on completion of his seven-years’ apprenticeship. In the eighteenth century, joiners designed and built wooden doors, windows, shutters, panelling, cupboards, and mouldings for interior spaces. Whereas carpenters used nails and dowels to stabilise their work, joiners used ‘scotch glue’, allowing them to create much more delicate and decorative work. In the centre of this joiner’s lid, the joiner himself is depicted in his workshop, surrounded by the tools of his craft, including saws, moulding plans, and a compass. 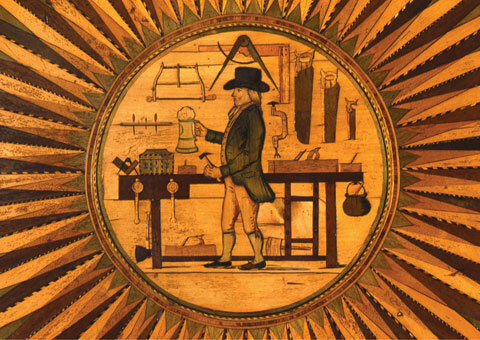 The large compass above his head and the intertwined compass and square on the left side of the workbench are symbols historically associated with freemasonry, which was accordingly associated with architecture and other building crafts. 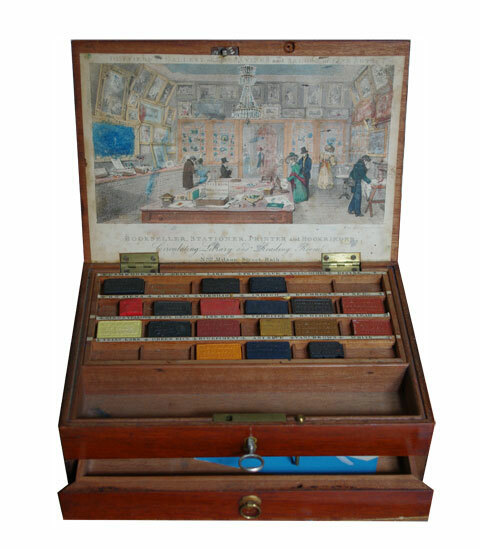 This paint box displays the range of hues available in watercolour in the early nineteenth century. A similar box can be seen on the table in Duffield’s Gallery in Milsom Street. A lithograph on the underside of the lid depicts customers browsing in Duffield’s Gallery, suggesting that the box was bought there. Certain pigments were very expensive and were a sign of personal wealth, thus painting and sketching became popular genteel pastimes in the eighteenth and early-nineteenth centuries. By the middle of the eighteenth century, rooms were no longer wholly panelled in wood; instead they were plastered above the wooden dado. Plaster cornices had also replaced wooden cornices, as they were relatively easy to apply using special tools. Decorative wall applications could also be achieved rater easily using moulds. 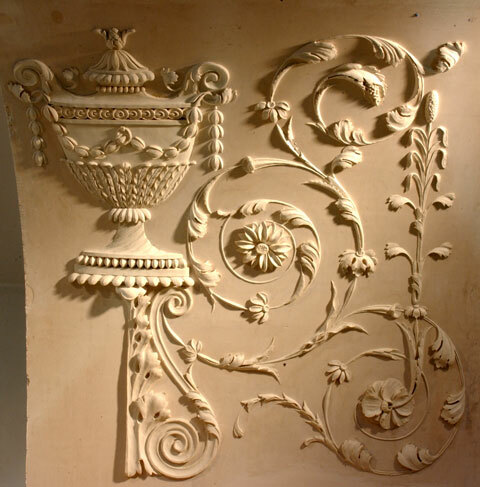 Plasterwork gained popularity during the eighteenth century due to the work of prominent designers and architects like Gringling Gibbons, Christopher Wren, and William Kent, who recreated Classical motifs in country houses using plaster. Some of Bath’s best preserved pasterwork is in the Assembly Rooms, build by John Wood the Younger in 1769. This panel is an example of hand-modelled plasterwork, created by an artist without moulds. It was made by one of the craftsmen later employed on the restoration of Prior Park after a devastating fire in 1991. Often, hand-modelling was reserved for decorative floral designs like this one, or for more intricate depictions of mythological of hunting scenes. 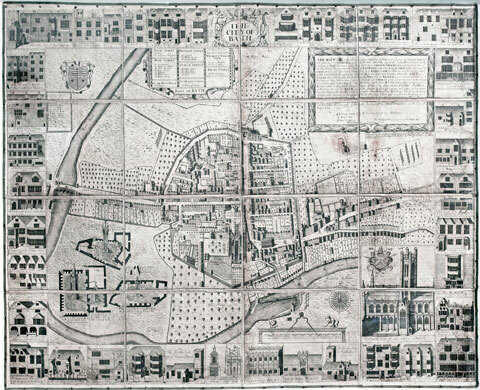 The Gilmore map of 1694 shows Bath as a city largely contained within its medieval walls, with a population of about 3,000. The map also advertises some of the city’s amenities, with many inns and lodging houses illustrated in the border. It captures the city in the late seventeenth century, just before the transformation of Georgian Bath was about to begin. A prominent illustration of Bath Abbey is featured in the lower right corner and a list of inns organised by street is just below the upper border, slightly to the left. This map is orientated with North to the right. This acorn was taken from the parapet of the Circus. By placing acorns along the top of the Circus, John Wood was making references to the legend of the founding of Bath following Bladud’s discovery of the healing hot waters; his leprous pigs were cured when they discovered the hot spring while foraging for acorns. The acorn also references Wood’s fascination with the Druids, who were the ‘Princes of the Hollow Oak’. In planning the new Georgian city, Wood wanted to give England its own version of Rom, and based much of his new projects in English folklore and heritage. 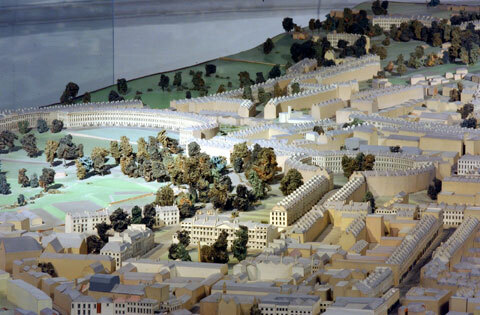 The Circus (meant to echo Rome’s Circus Maximus) was built to Wood’s measurements of Stonehenge as a temple to the sun, and the Royal Crescent just down Brock Street was conceived as a temple to the moon. The title of ‘architect’ was a prestigious one in the eighteenth century, At the time, there was no professional qualification for architects, but one did have to prove his knowledge of the principles of Classical style, geometry, mathematics, and sound construction to acquire a good reputation. Often, architects acted as surveyors as well; they had to survey land, lay out plots, ensure that builders were doing the work agreed upon, settle disputes, and decide each builder’s proportion of shared costs. 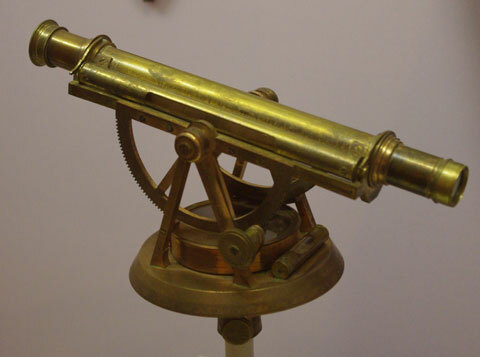 A theodolite (like the one picture above) is a telescope mounted on a tripod or pole and then placed on a firm base. It was used to calculate angels so that through trigonometry the surveyor could measure the distance and height of a building. The surveyor’s level is a simpler instrument than the theodolite because because it cannot measure angles. it was employed in measuring gradients and setting out levels and was used when surveying land and constructing drains or roads. Architects used fine brass instruments like those in the collection to render plans and elevations of their projects. 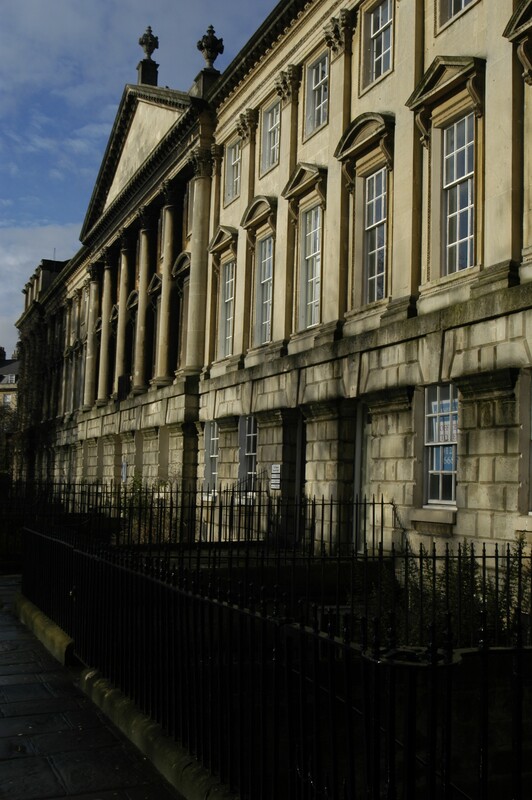 The distinctive style of architecture in Bath is based on principles of symmetry and proportion defined by the ‘Five Orders’ of architecture from classical antiquity. These Orders originated in Ancient Greece and developed throughout the Roman Empire but were lost during the Dark Ages. During the Italian Renaissance of the 15th Century classical architecture was rediscovered and architects such as Andrea Palladio began to use it as inspiration for new buildings. During the 17th century the architect Inigo Jones introduced a clear understanding of classical architecture into England and laid the foundations for a new English architectural style known as Palladianism. Made popular through architectural publications, the Palladian style soon dominated the design of new country houses and public buildings and came to define English architecture in the 18th century. 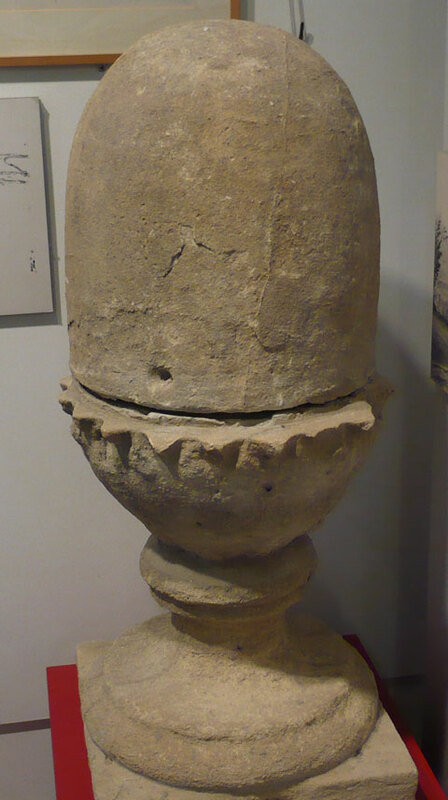 The museum collection contains many items that help tell the story of Palladianism in Bath. From 18th century architectural books to John Wood’s drawing instruments, the development of the style that continues to define the city is core to understanding why Bath looks the way it does. 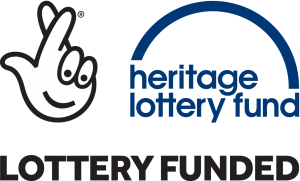 In 2013 we embarked on a project, thanks to the support of the Heritage Lottery Fund, exploring the twentieth century architecture of post-war Bath. The exhibition, ‘Brutal Bath: Building Post-War Bath’ at the Museum of Bath Architecture (formerly the Building of Bath Collection) explored the ideals and theories behind post-war British architecture and how it filtered down to Bath. ‘The Best for the Worst with the Least’ at the Museum of Bath at Work traced the history of social housing in Bath, revealing the stories behind some of the most significant twentieth century expansion in the city. 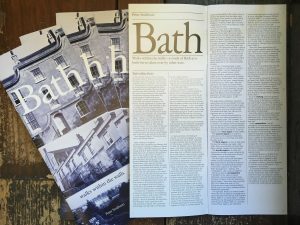 The 1969 architect Peter Smithson responded to the threatened demolition of St Mary’s Buildings in Bath by publishing a series of walks around the city in the magazine Architectural Design. He called them Bath: Walks Within the Walls. 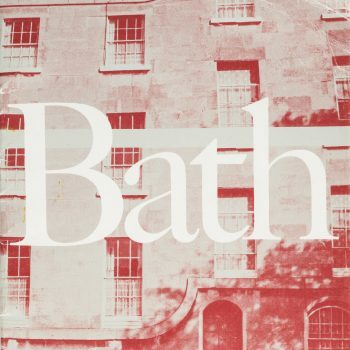 The walks were published again as a stand-alone booklet in 1971 during the peak of the systematic demolition occurring in the city that became known as the ‘Sack of Bath’. Being in Bath was to Peter like ‘being inside the shell of a previous culture’; but it was a ‘live-shell’, not frozen in time but a living, breathing and inhabited place. Bath: Walks Within the Walls encouraged people to study, appreciate and learn from that place. Alison and Peter Smithson’s experiences of Bath, and other cities such as Cambridge and Siena, taught them how historic cities could inspire new architecture and urban spaces. These ‘new lessons from old cities’, about form, materials and construction were fundamental to their ideas of overlays, lattices and layering. The Smithsons expanded these ideas of ‘conglomerate ordering’ through the buildings they designed for the University of Bath 1978-1990, where Peter was already teaching. By the late 1970s new developments were increasingly changing the face of Bath, as sites of demolition began to be filled. Peter returned once again to the Walks, revising the text and adding new images with the help of young architect Vicky Smith. 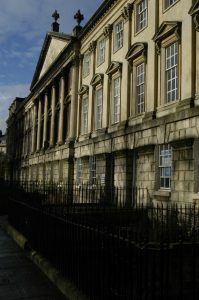 The 2nd edition of Walks Within the Walls acknowledged that the lessons Bath could teach were are risk from poor design. Walks Within the Walls, the University and the impact of Peter’s teaching there, are now woven into the architectural history of Bath. The Smithsons’ buildings at the University, the text and images of the walks and the countless other articles and writings they made about their work in the city all encourage us to see how the lessons of the past lead to the ideas of the present and can inspire the future ‘live-shell’ of Bath. In 217, to celebrate the 250th anniversary of the Royal Crescent, a building greatly admired by the Smithsons, a new edition of Walks With the Walls was produced in partnership between Bath Preservation Trust, the Smithson Family, Fielden Clegg Bradley Studios and The Edge at the University of Bath through the support of the Heritage Lottery Fund. From 1978 – 1990 Alison and Peter Smithson worked on a series of buildings at the University of Bath. They admired the original University campus design by Robert Matthew, Johnson-Marshall & Partners (RMJM) Architects, and recognised it as a ‘mat-building’, like a fabric laying on the sloping landscape of the hillside. The Smithsons wanted to understand and compliment that existing fabric and ‘weave onto its edges several terminating fringes’.